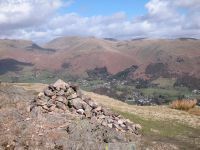 On Easter Monday 2006 the weather was rather iffy so I set myself a modest climb; the ascent of Silver How, from Grasmere. 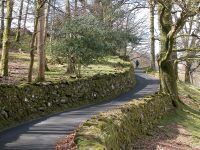 The road become enclosed within drystone walls. 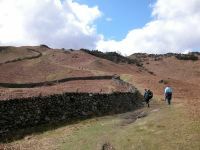 The top of this track comes out at a junction of walls and gates, and from here on there's a grassy track up to the ridge. 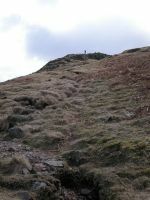 The path is still quite steep here. 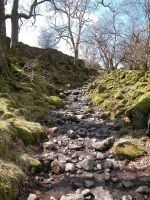 It accompanies another drystone wall. 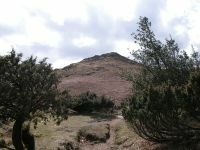 The path arrives at an area in which juniper and gorse grow in profusion. 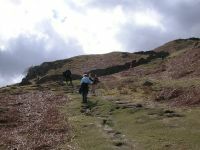 The vegetation provides some shelter if the day is windy, and this area therefore makes a good refreshment stop. The views are starting to become interesting. 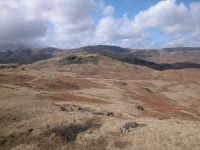 There's part of Grasmere below, backed by Heron Pike and Nab Scar. 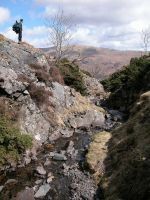 The path approaches a picturesque mini-ravine. 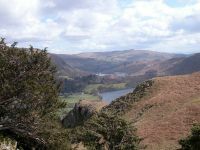 Looking southwestwards Grasmere lake is backed by Loughrigg. 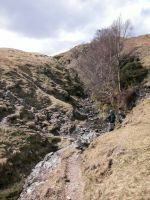 The path dips into and crosses the ravine, an interesting couple of minutes. 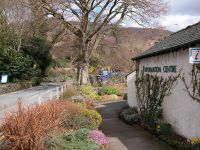 It's countless little treasures like this that make Lakeland such a marvellous place to visit and explore. 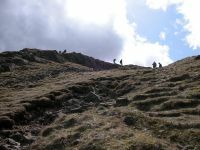 A track leads up the rough grass slopes to the top of Silver How, now only a few minutes away. The scene to the west. 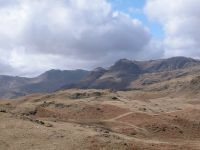 Bowfell (centre) still carries some snow; the Langdale Pikes (Pike O' Stickle and Harrison Stickle) stand to the right. 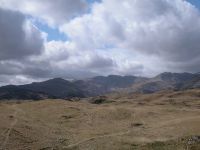 A dramatic skyline; Bowfell, the Pikes and Pavey Ark. 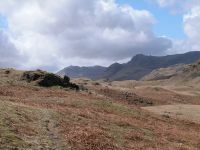 Panning around to the southwest we see Pike O' Blisco, Crinkle Crags and Bowfell. 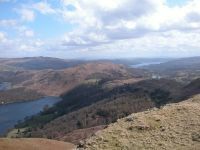 Looking southeastwards, and a glimpse of Windermere over the shoulder of Loughrigg. 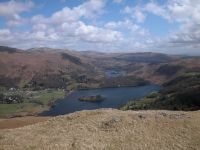 One of Lakeland's loveliest spots; the twin lakes of Grasmere (mearest) and Rydal Water. 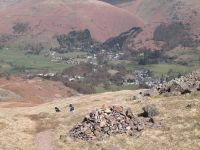 Grasmere village, backed by Stone Arthur, Grea Rigg and Fairfield. 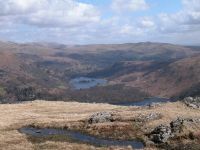 The path up to Grizedale Tarn leds into the hills towards the left of shot..
Loughrigg, sandwiched bwtween Rydal Water (left) and Windermere (right). 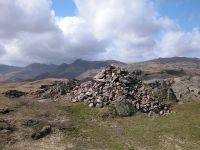 Silver How's summit cairn, backed by the Langdale Pikes (left) and Sergeant Man (right). Silver How is 1296 ft above sea level. 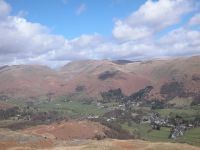 The classic view of Grasmere from the summit. 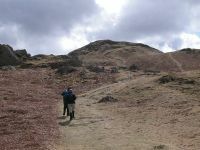 The ridge leading to Blea Rigg and Sergeant Man. 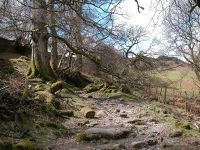 A fine walk in good weather, but today was too windy and cold to attempt it. 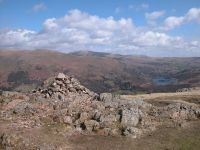 A final shot of the summit cairn, with Rydal Water seen to the right. 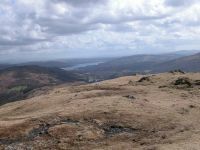 I wasted no time in getting back down into shelter, and had a bite of lunch among the junipers and gorse halfway back to the village. 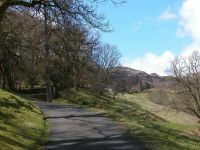 Back at Grasmere. The sunshine was very fitful otherwise I'd have taken rather more pictures. 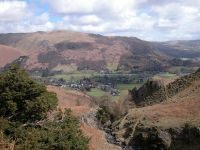 Grasmere is one of England's loveliest villages.